Clear vision is healthy living. 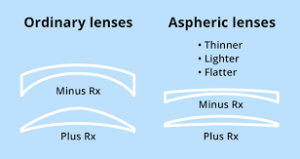 Depending on your prescription, the choice in lens material you choose can really make a difference in how well you see and the appearance of your glasses. If you have a high prescription, it will be worth every penny to invest in a quality premium material that will not only allow you to see sharper, but your glasses will be lighter and thinner and more attractive looking. This helps to minimize the “bug eye look”, especially for higher farsighted prescriptions. You’ll experience better vision in a lighter, thinner, more comfortable lens. Choosing to have an Anti-glare coating added to your lenses will help reduces reflections from all directions for less distracting glare and safer night-time driving. It also helps with eye fatigue when working under flourescent lighting, especially when on a computer. Crizal ® Non-glare lenses is the best-in-class transparency as it resist smudges, are easy to clean, as well improve the appearance of your glasses. This option allows the eyeglass lenses to darken when you step outside during the day and lighten when you step indoors. The darkening of the lenses is activated by UV light exposure, so the greater the sun-light (UV light) exposure, the darker the lenses. This is helpful during an overcast day because it will still darken slightly to give you the correct amount of shade and protect your eyes. There is still UV light exposure on cloudy days. Reduce your visual fatigue from electronic screens you view every day. These lenses are specifically designed for the visual needs of computer users. With larger intermediate viewing areas this lens is ideal for those hours you spend at your monitor. Dr. Truong and Dr. Ta will work with you to prescribe the ideal lens for your working conditions. The most effective way to eliminate glare for outdoor wear. Less glare from the road or the water, less squinting, less fatigue! Progressive Addition Lenses are glasses that allow you to see both distance and near vision within one pair of glasses. Progressive lenses allow for a gradual and seamless change in power from distant to near without the line or “jump” of traditional bifocals or trifocals. Progressive lenses are also more cosmetically attractive because they don’t look like bifocals. Bifocal with the lines can be associated with ‘old age’; the new single vision lenses are free of lines on the surface and thought to appear more ‘youthful’ and associated with younger eyeglass wearers. Utilizing these latest technologies, Essilor has developed the revolutionary Varilux Lenses. Varilux Progressive lenses are not only well known for their comfort and precision, but also for their personalization. Each pair of Varilux Physio lenses is custom made on an individual basis and resilient to scratches, glaring, and smudging. Thanks to these qualities, Varilux eyeglasses don’t need to be replaced or repaired as often as other types of glasses. Progressive lenses are not all the same. 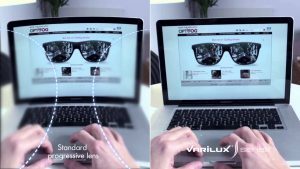 Once you experience the greater freedom of vision with one of the new Varilux X Series™ you will never want to go back to a traditional old-fashioned progressive lens. Varilux X lenses provide sharp vision and smooth transitions at any distance, it extends your vision within arm’s reach, so you no longer have to tilt or angle your head to find your focus. The X Series can only be found in eye care practices using digital measuring systems such as our M’Eye fit system® at Specs Appeal. You will not find this level of technology in surrounding eye practices. We offer the ultimate lens package that brings together the above innovative technologies to deliver your best vision, clarity, and protection in one pair of lenses. This package is available in two options: Progressive or Single Vision. The Progressive vision package combines Varilux lenses, Crizal, and Tansitions so that it extends the area of sharp vision within arm’s reach and beyond. Patients enjoy sharp vision at every distance without compromise. The Single Vision package defends the eye against eyestrain from extended up-close viewing of digital devices, and reduces exposure to Harmful Blue Light with Eyezen lenses, Crizal and Transitions. Personalize your lenses. Discover a customized solution for your lifestyle. Learn the science behind these lenses of how it can allow you to see details like never before. Contact our office today to find out more about the latest eyewear available at Specs Appeal in Decatur.